Cells of Burkholderia cepacia, from the Centers for Disease Control and Prevention. Burkholderia is a genus of rod-shaped, usually motile, Gram-negative bacteria, members of which are obligately aerobic and able to utilise poly-beta-hydroxybutyrate for growth. 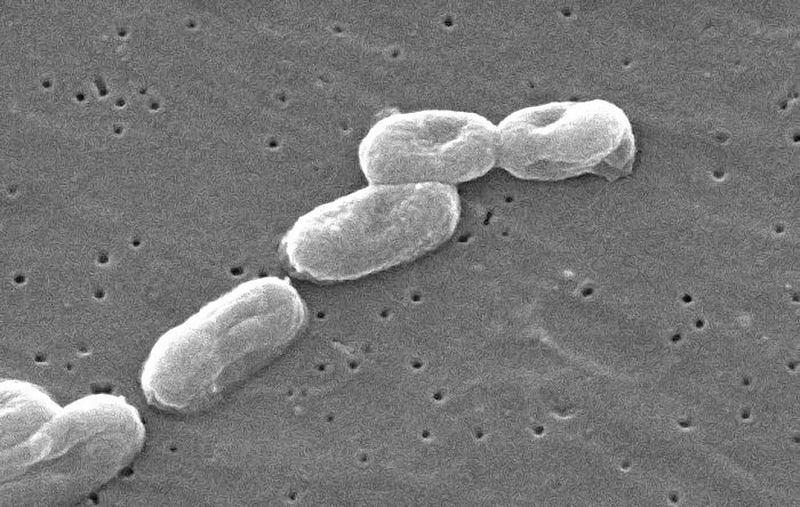 Species of this genus may be facultative pathogens of plants or animals (including humans), or they may be environmentally significant soil bacteria. [BL03] Bianciotto, V., E. Lumini, P. Bonfante & P. Vandamme. 2003. ‘Candidatus Glomeribacter gigasporarum’ gen. nov., sp. nov., an endosymbiont of arbuscular mycorrhizal fungi. International Journal of Systematic and Evolutionary Microbiology 53: 121–124. [GP03] Gupta, R. S., M. Pereira, C. Chandrasekara & V. Johari. 2003. Molecular signatures in protein sequences that are characteristic of cyanobacteria and plastid homologues. International Journal of Systematic and Evolutionary Microbiology 53: 1833–1842. [IJSEM03] IJSEM. 2003. Validation list no. 89. Validation of publication of new names and new combinations previously effectively published outside the IJSEM. International Journal of Systematic and Evolutionary Microbiology 53: 1–2. [NL03] Notomista, E. A. Lahm, A. Di Donato & A. Tramontano. 2003. Evolution of bacterial and archaeal multicomponent monooxygenases. Journal of Molecular Evolution 56: 435–445. [PR03] Peix, A., R. Rivas, P. F. Mateos, E. Martínez-Molina, C. Rodríguez-Barrueco & E. Velázquez. 2003. Pseudomonas rhizosphaerae sp. nov., a novel species that actively solubilizes phosphate in vitro. International Journal of Systematic and Evolutionary Microbiology 53: 2067–2072. [SC03] Sjöling, S., & D. A. Cowan. 2003. High 16S rDNA bacterial diversity in glacial meltwater lake sediment, Bratina Island, Antarctica. Extremophiles 7: 275–282. [WR03] Wenzel, M., R. Radek, G. Brugerolle & H. König. 2003. Identification of the ectosymbiotic bacteria of Mixotricha paradoxa involved in movement symbiosis. European Journal of Protistology 39 (1): 11–23.